A 60-kg and a 90-kg skydiver jump from an airplane at an altitude of 6000 m, both falling in the pike position. Make some assumption on their frontal areas and calculate their terminal velocities. How long will it take for each skydiver to reach the ground (assuming the time to reach terminal velocity is small)? Assume all values are accurate to three significant digits. This is College Physics Answers with Shaun Dychko. We have a skydiver that is falling in pike position which means they are falling head-first, distance of 6000 meters. They are going to be going at constant speed in our calculation because we assume that they reach terminal velocity really quickly. We’re told to neglect the amount of time needed to reach terminal velocity. So that means we can use this formula, the distance that they fall equals the speed multiplied by the amount of time it takes. We want to divide both sides by v to solve for t. So the work involved here is finding v, that’s going to be the terminal velocity. 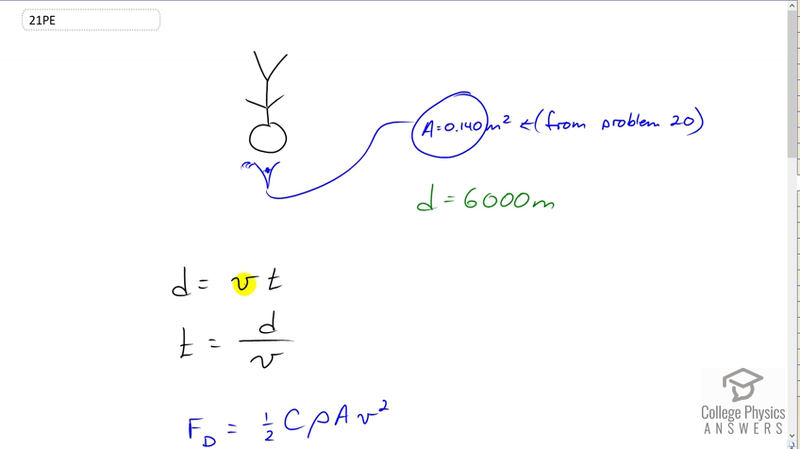 Now drag force is one half times the drag coefficient times the density of the fluid, or the density of air in this case, multiplied by the cross sectional area of the object times its speed squared. The drag force, because we have terminal velocity here, the drag force upwards is going to equal gravity downwards. And so in this case we can say that the drag force formula equals mg. And we’ll solve that for v by multiplying both sides by two and dividing both sides by C rho A and then taking the square root of both sides as well. So that’s what we’ll plug in for v in this formula for t. Now I don’t really like writing fractions within fractions and so instead of dividing by v, I’m going to multiply by its reciprocal which is the same mathematically. So I’m taking t equals d multiplied by this flipped over. So we have square root of C rho A over 2mg. For the 60 kilograms skydiver, the time is going to be 6000 meters multiplied by square root of 0.7, drag coefficient, multiplied by 1.21 kilograms per cubic meter, density of air, times 0.14 meters squared which we assume is the cross sectional area of the parachuter based on problem 20, which tells us that that’s a good assumption. Divide that by two times 60 kilograms times 9.8 meters per second squared, giving us 60.2 seconds. For the 90 kilograms skydiver, everything is the same except 90 is substituted instead of 60 for the mass, and this gives 49.2 seconds.